The 2018 BMW 330e iPerformance is equipped with a 2.0-liter turbocharged gasoline/electric hybrid drivetrain which offers a combined 248hp and 310 lb-ft of torque. Rear-wheel drive and an 8-speed automatic transmission are standard and performance levels are impressive for a hybrid but not so great when compared to other sporty sedans. Fuel economy promises to be excellent if your driving style and route make the most of the hybrid drivetrain. Standard equipment levels include power front seats with memory for the driver’s side and iDrive infotainment system while available features such as adaptive full LED headlights, parking assist and a navigation system with real-time traffic info are also on offer. 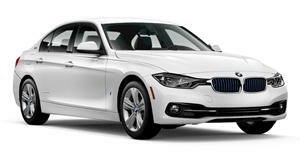 The 3-series Plug-in Hybrid is BMW’s current eco-friendly offering in its sporty luxury sedan range. It has been on sale since 2016 and whereas its predecessor, the ActiveHybrid 3 was based on the performance oriented 335i, this model shares some of its running gear with the more efficient base 320i. 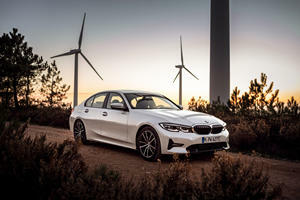 The 330e iPerformance Plug-in Hybrid has received the same updates for 2018 along with the rest of the 3-series range which means an update infotainment system and minor trim changes. Stepping into this hybrid it is clear that BMW is using a different approach from its stylistically futuristic i3 and i8 sub-brands. Save for a few additional dashboard dials, the interior of the Plug-in 3-series looks very much like the rest of the range. The quality levels are up there with the best in class, minor controls and buttons are laid out in the usual logical BMW manner. The battery pack is situated beneath the trunk so passenger space is identical to the gasoline powered cars and there is ample space for occupants in the front and the rear. The slightly reduced cargo space is still more than acceptable and the rear seats still fold forward to increase load space if required. The additional weight of the hybrid running gear does dampen the overall agility of this 3-Series and while it handles corners and bumpy roads with impressive poise and balance, there is little of that traditional driver focused feeling. The drivetrain allows for short periods of pure electric driving and the transition to the gasoline engine is unobtrusive enough, the transmission is also smooth and capable in most conditions. The cabin is a quiet place and it needs to be as the buzz of an internal combustion engine is not always on hand to mask potential creaks and rattles. An available smart navigation system will pre-assess a route and manage the battery charging and gasoline/electric powertrain split to optimize the fuel consumption. The 330e iPerformance is equipped with a turbocharged 2.0-liter four-cylinder engine which is combined with an electric drivetrain to produce a total of 248 horsepower and 310 lb-ft of torque. An 8-speed automatic transmission and rear-wheel drive are standard. 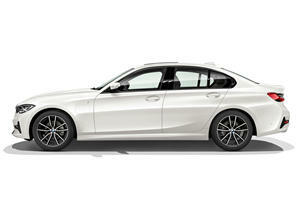 Equaling the 330i on power output, the heavier 330e gets to 60mph in 5.9-seconds versus 5.5. So, it may trail the conventionally powered 330i but against other hybrids this is a class-leading result and while consumption is heavily driver and situation dependent, a combined 71eMPG figure comprehensively outguns the 330i’s 34 mpg. Light-footed driving in the Max eDrive mode will keep the car in full electric mode up to a speed of 75mph and a range of 14 miles in this mode is claimed under ideal conditions. There is not much power available in this mode and a heavy prod of the throttle will have the gasoline engine jumping into life to help out. Charging can be done either at home overnight or much faster at a dedicated charging station, the Save Battery driving mode also allows the engine to maintain the battery at 50% charge although this will lower fuel economy levels. The 330e is available in one basic trim option that can be specified in either Sport Line, Luxury, Shadow Sport Edition and M Sport Design packages. All offer various visual differences and minor detail changes excepting the M Sport option which adds also includes, sporty suspension a sunroof and comfort access. Standard equipment includes power front seats, climate control and cruise control and a number of options are available either as part of a Convenience, Premium or Executive tier or individually. Notable items include a head-up display, adaptive cruise control, Harman Kardon surround audio system and Apple Car Play functionality. The Driving Assistance Package is a notable available extra and includes frontal collision and pedestrian warning, lane departure warning and automated braking systems. 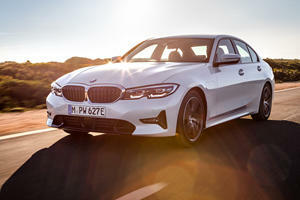 The integration of hybrid technology into the existing 3-Series platform has potentially yielded the most fuel-efficient model in the range, although in real-world driving conditions the highly efficient gasoline and diesel variants may be the 330e’s biggest challengers. A slightly numb driving experience also detracts from what is an otherwise impressive package, but once again these strengths are also available in the rest of the range and at a lower price, making the 330e a bit of a niche offering. Don't be surprised if the plug-in becomes the best-selling 3 Series. Is This The Best BMW 3 Series Hybrid Yet? New 3 Series plug-in features more power than ever thanks to XtraBoost feature. Expect the BMW 330e iPerformance plug-in hybrid to reach US dealers in 2020.